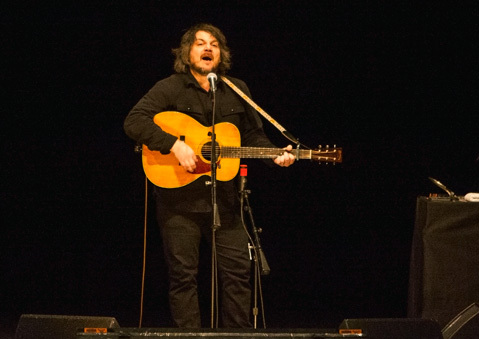 <b>FLYING SOLO:</b> Wilco's Jeff Tweedy proved himself to be an affable jokester during his solo show last Friday at the Granada Theatre. In recent years, Wilco’s live show has taken a turn for the jam. Onstage at the Arlington last February, the Chicago rockers found themselves bathed in strobe lights before an enthusiastic and sold-out crowd. The songs sounded great — don’t get me wrong — but the riffing, noodling, and improvisation felt like it took up about a third of the evening’s duration. There were Deadheads. Lots of them. And they were loving it. For those who left that show feeling nostalgic for Wilco’s tighter, more-structured days, Jeff Tweedy’s solo performance at the Granada last week hit the mark nicely. Onstage with little more than an acoustic guitar and a spotlight, the frontman took fans on a delightful — and hilarious — romp down memory lane that included “deep cuts,” covers, and Wilco classics well worthy of the (many) sing-alongs attendees offered up. Wilco fans will readily admit that 2002’s Yankee Foxtrot Hotel is one (if not the) gold star on the band’s eight-album résumé. On Friday, Tweedy played to his strengths by opening the show with Foxtrot’s beautifully famous “I Am Trying to Break Your Heart” and sprinkling snippets from the record (“Kamera,” “Jesus Etc.”) throughout the night’s hour-and-a-half-long set list. Among the highlights, Tweedy’s multiple dips into the pre-Wilco pool proved especially rewarding. Fans got treated to Uncle Tupelo’s whiskey-soaked twang on “New Madrid” early on, then the solemn tone and quick-paced fingerpickin’ of “Wait Up” as the night pushed on. Stripped of their bells and whistles, Wilco songs like “Born Alone” and “Passenger Side” shone bright as well, with Tweedy’s somber, smart, and all-too-human lyrics lying bare for all to hear. Late in the set, and joined onstage by Wilco keyboardist (and Ojai resident) Mikael Jorgensen, the singer gave us an especially poignant rendition of the lullaby off of A Ghost Is Born, “Hummingbird,” which he dedicated to a little girl in the audience named Haley. Fittingly, the show ended with Foxtrot’s “I’m the Man Who Loves You,” prompting plenty to sing along and some to smile knowingly at the in-joke. Tweedy is a man best articulated in song, and whether he’s fronting a jammy Wilco or left alone to his own devices, it turns out we love him, too.